An immigrant from Europe, but apparently much rarer than C. jacea. Very local in disturbed, weedy places, e.g., dumps and roadsides. 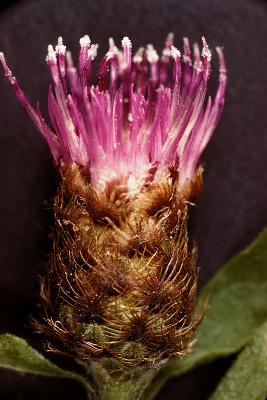 The first collection was 1928 in Cheboygan Co.
Centaurea nigra is considered to lack enlarged marginal flowers in the heads. The hybrid with C. jacea, C. ×moncktonii C. E. Britton (C. ×pratensis of Michigan Flora), seems more widespread than C. nigra. 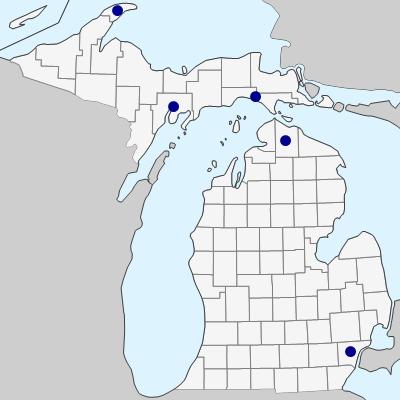 We have records from Alpena, Bay, Delta, Gogebic, Houghton, Isabella, Kalamazoo, Leelanau, Lenawee, Marquette, Menominee, Oakland, Ontonagon, Sanilac, Schoolcraft, Washtenaw, and Wayne Cos. Besides the enlarged marginal flowers, it is distinguished by paler phyllary appendages (of which some middle ones are only split or lacerate, not fringed) and achenes without a pappus. In C. nigra, only the innermost phyllaries lack a well-developed ciliate fringe on the appendages. The Mackinac Co. specimen (Ehlers 4577 in 1929, BLH, MICH) is unusual in having rather narrowly triangular phyllary appendages. It may be an introduction of a different strain or different subspecies, or perhaps is of hybrid origin with some other species. MICHIGAN FLORA ONLINE. A. A. Reznicek, E. G. Voss, & B. S. Walters. February 2011. University of Michigan. Web. April 21, 2019. https://michiganflora.net/species.aspx?id=274.